Bring a large pot of salted water to a boil. Cook spaghetti according to package directions. Meanwhile, heat a large skillet over medium heat and cook bacon until tender, about 5 minutes. Add red onion and cook until translucent, about 10 minutes. Add tomatoes and red pepper flakes. Reduce heat to medium-low and cook until sauce is slightly reduced, about 8 minutes. Strain spaghetti, reserving 1/4 cup pasta water. 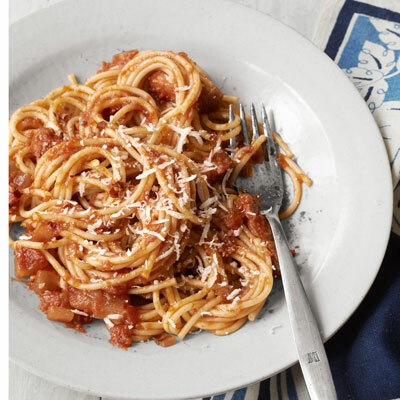 Add spaghetti and pasta water to sauce, and toss. Season with salt and pepper. Sprinkle with pecorino romano.